Chelsea manager Antonio Conte has stated that he is impressed by Cesc Fabregas. He said that the player had displayed the right attitude by choosing to fight for his place when he has been left on the bench. 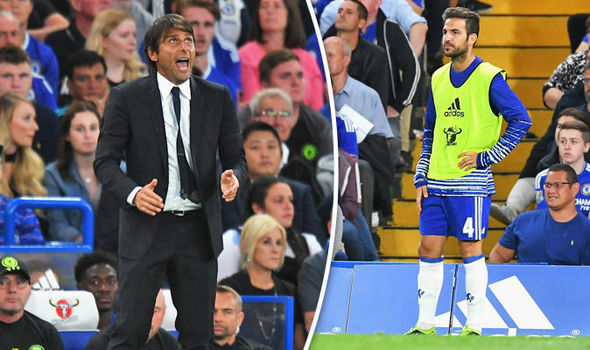 The manager stated that this is the best mentality a player can have and has praised Cesc Fabregas for demonstrating such an attitude. Conte stated that he really appreciates the attitude shown by Cesc Fabregas. He said that the player is working hard in training to show the coach that he deserves to be playing, and that is really interesting. The coach stated that this is what he wants to see in players. He wants his players to show him desire and determination on the training ground. He said that he is not interested in having big names on the field but rather in having players that are interested in playing for the team. Antonio Conte said that as a manager he wants to see commitment from his players, and this is what he is seeing in Cesc Fabregas. He stated that for a club to be successful, it is important that players place the team first and not themselves. He said that Fabregas has understood this aspect of football and is really motivated to improve himself. Indeed the player is seizing every opportunity he is getting to prove the manager that he is ready. Last weekend he came off the bench and set up a goal for Diego Costa. The manager said that he appreciates the determination and the motivation of the player and said that he would give him his chance when he is ready. At the moment Fabregas seems to be behind Kante and Matic in the pecking order and will want to change that by showing the manager that he is able to start games.